For almost 500 years (510-27 B.C. ), Rome was a Republic and not a dictatorship as it turned into after Julius Caesar and the civil wars that followed. Over it’s evolution, Rome had many different coin types issued. This guide is to the silver coins of the Romans from the time of the Republic. Watch the video above for a great explanation on the topic and how to start collecting, along with examples of types available. All of the coins from the Roman Republic have a reference to a standard book on the subject, Roman Silver Coins Volume 1 by David R. Sear which is a must for any ancient coin library that is interested in the topic. Quite frankly it is the only book on you really need on the silver coins of the Roman republic, along with those of Julius Caesar, Mark Antony, Lepidus and even Augustus. The author, David R. Sear, adopted the standard that Ernest Babelon arranged them in 1885 for the quickest reference purposes. This area of collecting is one of my personal favorites. There are many important coins dealing with historical events, great generals, important personages, the gods, the goddesses, festivals, architectural works, stories and so much more. However, just like with any topic, it is good to have a guide that will help you learn that it is more simple than you even thought to pursue the collecting of these types. The video you can watch , shows you many types and gets you familiarized with the subject. The list below, allows you to quickly search my store and learn more about the various types of coins according to what I have available at this time. This part of the guide is designed to give you an easy way to search my eBay store with advanced search parameters, which search for the specific moneyer names below with the description that are in line with the book: Roman Silver Coins Volume 1 by David R. Sear. As you click each, you will be able to see any examples of that specific moneyer I have available. 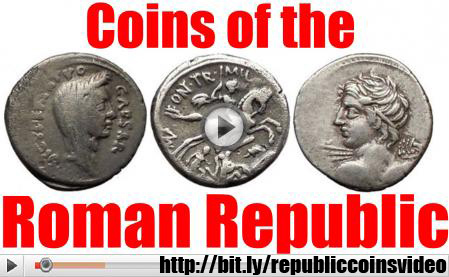 The goal of this list is to make it easy and fun to explore, learn and even put together a very comprehensive collection of ancient Roman Republican coins. You can also do a search yourself in my store for by checking off the box that says “in titles & descriptions” and then typing in specifically in quotes “”, the parameter like this: “reference: moneyernamehere”. This way if you are already proficient in the types and are looking for specific examples, you can find them yourself also without having to refer to this guide. Cool article about numismatic coins. World-renowned numismatic expert posted this to educate people.